A study for this drawing is in the AGNSW's Gleeson 'Sketchbook 1', pg. 69 (35). The painting from both these drawings was completed in 1984. For another related drawing see Lou Klepac's 'James Gleeson, landscape out of nature', Beagle Press, Sydney, 1987, pl. 61. 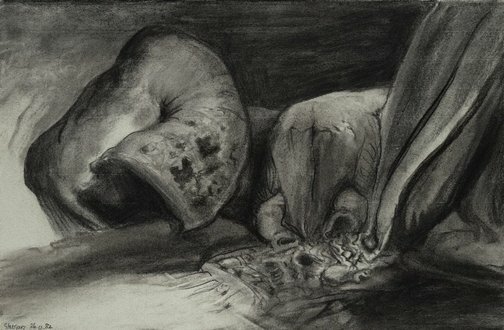 Having built up a body of drawings since 1977, Gleeson turned to them in his search for studies suitable for paintings. This explains why some drawings precede some paintings by several years. Occasionally more than one drawing was used for various parts of a painting, as in this painting. In 'La costa metamorphica' the principal elements of both studies are combined in a more intense composition. Hendrik Kolenberg and Anne Ryan, 'James Gleeson: drawings for paintings', Art Gallery of New South Wales, 2003, pg. 72. Signed and dated l.l., charcoal "Gleeson 26.12.82".